Georgie Auld (May 19, 1919 – January 8, 1990) was a jazz tenor saxophonist, clarinetist and bandleader. Auld was born John Altwerger in Toronto. He lived in the United States from the late 1920s onward, and was most noteworthy for his work with Bunny Berigan, Artie Shaw, Benny Goodman, Erroll Garner, Dizzy Gillespie, Al Porcino, Billy Eckstine, Tiny Kahn, Frank Rosolino, and many others. 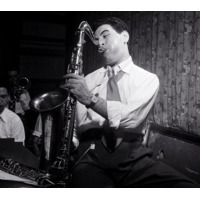 Primarily a swing saxophonist, he did many big band stints in his career, and led several big bands, including Georgie Auld and His Orchestra and Georgie Auld and His Hollywood All Stars. Auld also played some rock´n roll working for Alan Freed in 1959.